For other uses, see Sevastopol (disambiguation). Sevastopol or traditionally Sebastopol (/sɛvəˈstoʊpəl, -ˈstɒpəl/ or /sɛˈvæstəpəl, -pɒl/ Russian: Севасто́поль (same in Ukrainian); Crimean Tatar language: Aqyar; Greek: Σεβαστούπολη, Sevastoupoli) is a city located in the southwestern region of the Crimean Peninsula on the Black Sea. The city is currently a subject of territorial dispute, as a result of annexation of Crimea, between Ukraine, which considers Sevastopol as a city with special status, and Russia, which itself considers it a federal city within the Crimean Federal District. Although relatively small at 864 square kilometres (334 sq mi), Sevastopol's unique naval and maritime features provide the basis for a robust economy. The city enjoys mild winters and moderate warm summers; characteristics that help make it a popular seaside resort and tourist destination, mainly for visitors . The city is also an important centre for marine biology; in particular, dolphins have been studied and trained in the city since the end of World War II. In English, the current prevalent spelling of the name is Sevastopol; the previously common spelling Sebastopol is still used by some publications such as The Economist. In English the current spelling has the pronunciation /səˈvæstəˌpoʊl/ or /ˌsɛvəˈstoʊpəl/, whilst the former spelling has the pronunciation /sɨˈbæstəpəl, -pɒl/ or /səˈbæstəˌpoʊl, -ˌpɔːl/. Russian: Севастополь, pronounced [sevɑsˈtɔpɔlʲ] in Ukrainian and [sʲɪvɐsˈtopəlʲ] in Russian. Crimean Tatar language: Aqyar, pronounced [aqˈjar]. A panorama of the siege originally was created by Franz Roubaud. After its destruction in 1942 during WWII, it was restored and is currently housed in a specially constructed circular building in the city. It portrays the situation at the height of the siege, on 18 June 1855. During World War II, Sevastopol withstood intensive bombardment by the Germans in 1941–42, supported by their Italian and Romanian allies during the Battle of Sevastopol. German forces were forced to use railway artillery and specialised heavy mortars to destroy Sevastopol's extremely heavy fortifications, such as the Maxim Gorky naval battery. After fierce fighting, which lasted for 250 days, the supposedly untakable fortress city finally fell to Axis forces in July 1942. It was intended to be renamed to "Theodorichshafen" (in reference to Theodoric the Great and the fact that the Crimea had been home to Germanic Goths until the 18th or 19th century) in the event of a German victory against the Soviet Union, and like the rest of the Crimea was designated for future colonisation by the Third Reich. It was liberated by the Red Army on May 9, 1944 and was awarded the Hero City title a year later. At the 1955 Ukrainian parliamentary elections on February 27, Sevastopol was split into two electoral districts, Stalinsky and Korabelny (initially requested three Stalinksy, Korabelny, and Nakhimovsky). Eventually Sevastopol received two people's deputies of the Ukrainian SSR elected to the Verkhovna Rada A.Korovchenko and M.Kulakov. Following the breakup of the Soviet Union, Moscow refused to recognise Ukrainian sovereignty over Sevastopol as well as over the surrounding Crimean Oblast, using the argument that the city was never practically integrated into the Ukrainian Soviet Socialist Republic because of its military status. On December 11, 1992, the President of Ukraine called the attempt of the Russian deputies to charge the Russian parliament with the task of defining the status of Sevastopol as an "imperial disease". On December 17, 1992, the office of the Ukrainian presidential representative in Crimea was created, which caused a wave of protests a month later. Among the protesters who organised the unsanctioned rally were the Sevastopol branches of the National Salvation Front, the Russian Popular Assembly, and the All-Crimean Movement of the Voters for the Republic of Crimea. The protest was held in Sevastopol on January 10 at the Nakhimov Square. On March 16, a controversial referendum on leaving Ukraine took place in the city, along with the rest of Crimea. During the voting the Building of the Supreme Council of Crimea was controlled by the Russian military. The official reports by the organizers of the referendum were that a majority of 95.6% voted to become a part of the Russian Federation, albeit these results are contested (see Crimean status referendum, 2014#Alternative estimates of results for details). This referendum resulted in the establishment of the short-lived Republic of Crimea, which consisted of both Sevastopol and Crimea. 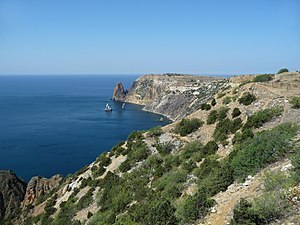 Sevastopol has a humid subtropical climate (Köppen climate classification: Cfa), bordering on a humid continental climate, with cool winters and warm summers. The executive power of Sevastopol is exercised by the Sevastopol City State Administration led by a chairman. Since April 2014 the executive power is held by the Government of Sevastopol, led by the Sevastopol (Russia). The population of Sevastopol proper is 342,451 (2001), making it the 15th largest city in Ukraine and the largest in Crimea. City agglomeration has population 961,885 (2008). According to the Ukrainian National Census, 2001, the ethnic groups of Sevastopol include Russians (71.6%), Ukrainians (22.4%), Belarusians (1.6%), Tatars (0.7%), Crimean Tatars (0.5%), Armenians (0.3%), Jews (0.3%), Moldovans (0.2%), and Azerbaijanis (0.2%). ↑ "Меняйло утвержден губернатором Севастополя на фоне конфликта с Чалым". РБК. http://top.rbc.ru/politics/09/10/2014/54367444cbb20f6995c1bfab. ↑ "Севастополь перешел на российскую нумерацию". sevastopol.gov.ru. http://sevastopol.gov.ru/sevastopol-pereshel-na-rossijskuyu-numeraciyu.html. ↑ 3.0 3.1 Merriam-Webster. "Merriam-Webster's Collegiate Dictionary". Merriam-Webster. http://unabridged.merriam-webster.com/collegiate/. ↑ "definition: meaning, pronunciation and origin of the word". Oxford Dictionary. Oxford University Press. 2014. http://www.oxforddictionaries.com/definition/american_english/Sevastopol. Retrieved 7 June 2014. ↑ "definition: meaning, pronunciation and origin of the word". Oxford Dictionary. Oxford University Press. 2014. http://www.oxforddictionaries.com/definition/english/Sebastopol. Retrieved 7 June 2014. ↑ "definition: meaning, pronunciation and origin of the word". Oxford Dictionary. Oxford University Press. 2014. http://www.oxforddictionaries.com/definition/american_english/Sebastopol. Retrieved 7 June 2014. ↑ "definition: meaning, pronunciation and origin of the word". Oxford Dictionary. Oxford University Press. 2014. http://www.oxforddictionaries.com/definition/english/Sevastopol. Retrieved 7 June 2014. ↑ "The Ukrainian Soviet Encyclopedia". Leksika. ↑ "The Great Soviet Encyclopedia". Yandex. ↑ "Основание и развитие Севастополя (Osnovaniye i razvitiye Sevastopolya)" (in Russian). Foundation and development of Sevastopol. Sevastopol.info. 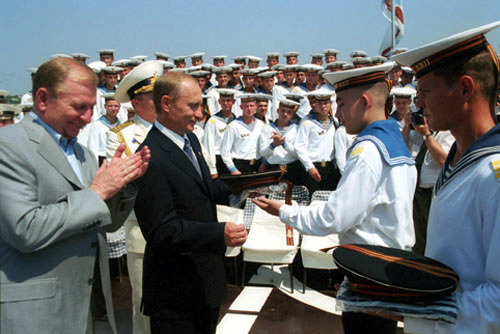 2007-05-28. http://www.sevastopol.info/history/hist_first.htm. Retrieved 2010-04-26. ↑ 11.0 11.1 11.2 11.3 "Українське життя в Севастополi Михайло ЛУКІНЮК ОБЕРЕЖНО: МІФИ! Міф про юридичну належність Севастополя Росії". archive.org. Archived from the original on 8 December 2014. https://web.archive.org/web/20141208165334/http://ukrlife.org/main/uacrim/obermif34.htm. ↑ "小褌邪褌褜懈 / 谐邪蟹械褌邪 肖谢芯褌 校泻褉邪褩薪懈: 袩袨效孝袠 50 袥袝孝 袧袗袟袗袛. 小袝袙袗小孝袨袩袨袥鞋 袙 1955 袚袨袛校". archive.org. Archived from the original on 8 December 2014. https://web.archive.org/web/20141208203215/http://fleet.sebastopol.ua/articles/POChTI_50_LET_NAZAD._SEVASTOPOL_V_1955_GODU/printable/. ↑ Schmemann, Serge (July 10, 1993). "Russian Parliament Votes a Claim to Russian Port of Sevastopol". http://www.nytimes.com/1993/07/10/world/russian-parliament-votes-a-claim-to-ukrainian-port-of-sevastopol.html. ↑ "People". December 28, 2005. http://english.people.com.cn/200512/28/eng20051228_231329.html. ↑ "Parliamentary chaos as Ukraine ratifies fleet deal". BBC. 27 April 2010. http://news.bbc.co.uk/2/hi/europe/8645847.stm. ↑ "Севастополь принял решение о вхождении в состав РФ : Новости УНИАН". Unian.net. http://www.unian.net/politics/893910-sevastopol-prinyal-reshenie-o-vhojdenii-v-sostav-rf.html. Retrieved 2014-03-07. ↑ "Парламент Крыма принял Декларацию о независимости АРК и г. Севастополя [Crimean parliament adopted the Declaration of Independence of the ARC and Sevastopol"] (in Russian). 11 March 2014. http://www.rada.crimea.ua/news/11_03_2014_1. Retrieved 12 March 2014. ↑ 23.0 23.1 "ВС Крыма принял незаконное решение о проведении референдума – Турчинов". unian.net. http://www.unian.net/politics/893876-vs-kryima-prinyal-nezakonnoe-reshenie-o-provedenii-referenduma-turchinov.html. ↑ "Президент России". kremlin.ru. http://kremlin.ru/news/20605. ↑ Gutterman, Steve. "Putin signs Crimea treaty, will not seize other Ukraine regions". Reuters.com. http://www.reuters.com/article/2014/03/18/us-ukraine-crisis-idUSBREA1Q1E820140318. Retrieved 2014-03-26. ↑ Kottek, M.; J. Grieser (2006). "World Map of the Köppen-Geiger climate classification updated". pp. 259–263. Digital object identifier:10.1127/0941-2948/2006/0130. http://www.schweizerbart.de/resources/downloads/paper_free/55034.pdf. Retrieved 28 August 2012. ↑ "The duration of sunshine in some cities of the former USSR" (in Russian). Meteoweb. http://meteoweb.ru/cl006.php. Retrieved 29 September 2012. ↑ "Contemporary Ukraine". google.com. http://books.google.com/books?id=tedMMgz3RV8C&pg=PA44&dq=Sevastopol++appointed+by+the+President+of+Ukraine&hl=nl&sa=X&ei=gBsOU-fcMuOL0AXknoDYDg&ved=0CFoQ6AEwBg#v=onepage&q=Sevastopol%20%20appointed%20by%20the%20President%20of%20Ukraine&f=false. ↑ "The City State Administration". Sevastopol City State Administration. http://sev.gov.ua/en/administr/. Retrieved 30 March 2014. ↑ "Ukraine: Sevastopol installs pro-Russian mayor as separatism fears grow". 25 February 2014. http://www.theguardian.com/world/2014/feb/25/ukraine-sevastopol-installs-pro-russian-mayor. Retrieved 29 March 2014. ↑ "Sevastopol City Council refuses to recognize Kyiv leadership". 2 March 2014. http://www.kyivpost.com/content/ukraine/sevastopol-city-council-refuses-to-recognize-kyiv-leadership-338124.html. Retrieved 29 March 2014. 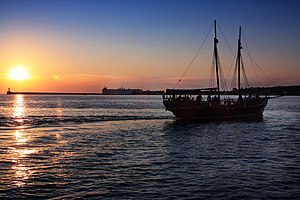 ↑ "Sevmorverf (Sevastopol Shipyard)". Federation of American Scientists. 24 August 2000. http://www.fas.org/nuke/guide/russia/industry/sevmorverf.htm. Retrieved 8 July 2013. ↑ "2001 Ukrainian census". Ukrcensus.gov.ua. http://2001.ukrcensus.gov.ua/eng/results/general/nationality/Sevastopol/. Retrieved 2010-04-26. ↑ "Balaklava Bayfront Plaza, Sevastopol". SkyscraperPage.com. http://skyscraperpage.com/cities/?buildingID=82259. Retrieved 2010-04-26. ↑ "В Харькове появится памятник Сагайдачному". Status Quo. http://www.sq.com.ua/rus/news/obschestvo/23.08.2014/v_harkove_poyavitsya_pamyatnik_sagajdachnomu/.